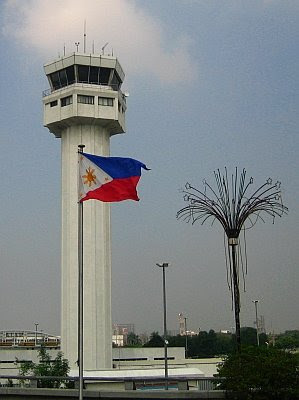 Ninoy Aquino International Airport, formerly called Manila International Airport, serves as the official gateway to the Philippines. For information on first-time visitors to the Philippines and also for newbie flyers who're looking for information on how to get to the airport for your flight, Tutubi wrote down this guide based on his own personal knowledge. Don't even think of cracking a bomb joke at the airport. Filipinos may have a sense of humor but bomb jokes can make you miss your flight and get you in serious trouble with the police and airport security people. Option 1: There are jeepneys going to the terminal in Baclaran (you may take the LRT and get off at Baclaran terminal). Option 2: On EDSA, wait for buses with signboards MIA (as in Manila International Airport) that pass by the terminal (you need to walk though). Option 3: Take a taxi all the way to the airport. From Quezon City Munoz, taxi fare at night is just P280 (trip takes about 40 minutes on lean hours), from Makati CBD is just around P150 (travel time around 20 minutes) while from Ermita and Malate districts of Manila it's about P250. Taxi fare goes up in heavy traffic though. From EDSA, drive towards Makati, past Magallanes interchange and take the left-turn ramp/flyover to Aurora Boulevard. Turn right at the end (Andrews Avenue) then left at the next intersection [Domestic Road, landmarks: Petron and Caltex] then another left on NAIA Road (formerly MIA Road) [landmark: Caltex gas station] then finally a right on Ninoy Aquino Avenue [landmarks: NAIA park on your right, Caltex to your left]. Head straight until you see the terminal ramps. There are direction signs along the way so you won't get lost. Metered taxis (yellow cabs) available right of exit gates charge more expensive than regular metered taxis (flagdown rate is P70.00) with P4 for every 300 meters. In order to flag a metered taxi, upon exit look for the escalators going up to the departure area and hire a taxi that had just offloaded passengers. Option 3: Take a taxi all the way to the airport. From Quezon City Munoz, taxi fare at night is just P280 (trip takes about 40 minutes on lean hours), Makati CBD is just around P150 (travel time around 20 minutes) while from Ermita and Malate districts of Manila it's about PhP250. Taxi fare goes up in heavy traffic though. From EDSA, drive towards Makati, past Magallanes interchange and take the ramp/flyover going to Aurora Boulevard. Turn right at the end (Andrews Avenue) then left at the next intersection (Domestic Road) [landmarks: Petron and Caltex] left on MIA Road (NAIA Road) [you'll see Nayong Pilipino on your left] until you see the terminal ramps. There are direction signs along the way so you won't get lost. Metered taxis (yellow cabs) available right of exit gates charge slightly more expensive than regular metered taxis (P70 flag down rate). From Laguna and Batangas via SLEX, take the exit ramp in Nichols right after the SLEX toll gates, turn left towards Villamor Airbase then go around the rotonda infront of NAIA Terminal 3. From the north via C5, drive towards Fort Bonifacio towards 5th Avenue where you drive all the way to Villamor Airbase (Nichols) until you see the rotonda and the entrance of terminal 3. Alternately, from EDSA, take the flyover to airport road, turn right on Andrews Avenue (landmark: Caltex gas station), make a U-turn at the rotonda, then drive until you see the terminal in front of another roundabout. There are no tubes used at Terminal 3 on deplaning for domestic travel. Passengers are required to board shuttle buses to and from the boarding gates. Option 1: Jeepneys plying the Nichols to SM Mall of Asia via Macapagal Avenue and Tramo route pass by Andrews Avenue in front of the terminal. Option 2: On EDSA, wait for buses with signboards MIA (as in Manila International Airport), alight on Airport Road then transfer to Nichols-bound jeeps. Option 3: At EDSA Taft Rotonda (from MRT EDSA Station or LRT Taft Avenue station), board jeepneys with Nichols/Terminal 3 on the signboard. Option 3: There's a direct bus to Terminal 3 via C5 from Eastwood City, Libis, Quezon City via Fort Bonifacio going to Newport City in front of Terminal 3, operated by Citylink Coach Services (Citylink Business Class is emblazoned on the side of the bus, the same company providing The Fort bus service). Option 4: The best yet most expensive, take a cab all the way to the airport terminal. From Quezon City Munoz, taxi fare at night is just P220 (trip takes about 40 minutes on lean hours) and from Makati CBD is just around P110 (travel time around 20 minutes). Taxi fare goes up in heavy traffic though. Metered taxis (yellow cabs) available right of exit gates charge P70 for the first 500 meters and P4 for the every succeeding 300 meters and P4 for every two minutes of waiting time. Metered taxi from MGE and EMP are available at the far right end. In order to flag a metered, upon exit head straight towards Andrews avenue where metered taxis are queued up. Note that taxi drivers here always try to negotiate a rate and not use the meter. You can also ride the jeepney going to Mall of Asia via Tramo and Macapagal Avenue or drop off at Aurora Boulevard then transfer to an EDSA-bound bus to your destination. 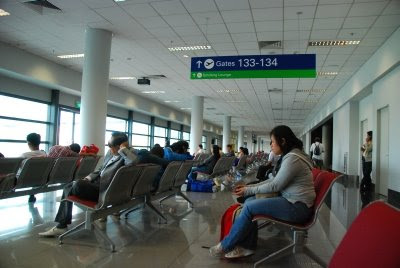 Of all airport terminals in Manila, this is the most commuter-friendly where public transportation is readily available. You can immediately board a bus to EDSA or a jeep to Baclaran just a few steps outside the terminal. Option 3: Take a taxi all the way to the airport. From Quezon City Munoz, taxi fare at night is just P220 (trip takes about 40 minutes on lean hours) and from Makati CBD is just around P110 (travel time around 20 minutes). Taxi fare goes up in heavy traffic though. From Quezon City via EDSA, drive towards Makati, past Magallanes and take the left-turning ramp/flyover to Aurora Boulevard. Turn right at the end (Edwards Avenue) then left at the next intersection (Domestic Road) [landmarks: Petron and Caltex gas stations]. Continue until you see the Domestic Airport on your left. Unlike other large airports (e.g. 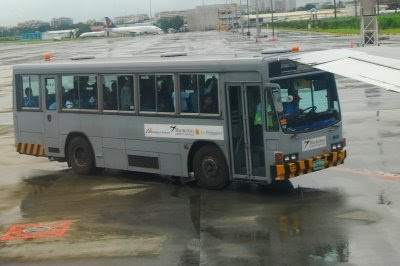 Hong Kong), where terminals are linked by dedicated rails, Manila's 4 terminals are now serviced by free shuttle service should you need to transfer to another terminal to catch a connecting flight. On arrival terminal 1, turn right on leaving the arrivals hall and the shuttle stop is about fifty meters in front of you. At Terminal 2 (PAL terminal), exit arrival hall and the stop is about one hundred meters and a little to the right. A large blue and white sign makes it impossible to miss. The driver said the circuit takes about thirty minutes. At Terminal 3 arrival exit, the shuttle queue is just a little to the right, about 20 meters from the door exits. Money changers are present in all terminals but usually sell Pesos at higher rates (usually by one or two pesos more) than those outside and buy dollars a peso or two less than the present exchange rate. For taxis, you may need to haggle with some drivers who ask for additional fares on top of the meter or simply ask for a fixed fare (kontrata). Proceed to the next taxi if that's the case. This specially true to foreigners. Regular Taxi fares in Manila comes with a P40 flagdown rate (plus P10 mandated in addition to the flagdown to offset rising fuel costs) the first 500 meters plus P3.50 for every 300 meters and P3.50 for every two minutes waiting time (or idle time in heavy traffic). If you intend to drive your own car to catch your flight, you may opt to park your car at Park n Fly where a shuttle service can take and fetch you at the airport. Rates are P10/hour with minimum of 24 hours. Overnight Parking at NAIA Terminal 2: PhP50.00/night or PhP35 day rate. If you can't figure out the directions given, you may refer to this map of Ninoy Aquino International Airport and immediate vicinity. Should you know of other ways to commute to the airport terminals, please leave a comment for Tutubi to update the information contained herein. thanks for posting this! really helpful! thanks for the post! this info. is really good! Thanks for the post, its really a big help for me. God bless! What are the airlines flying in and out of NAIA 1 (Internatiional Flights)? Great stuff! and very detailed too. This will be useful as we go to T3 today. Is there free wireless internet in the international waiting area of NAIA 2? Hi! Is it safe to take a bus going to NAIA 1,especially when you take a walk going to the arrival area after you drop off to the bus? do they have overnight parking at naia terminal 2? thank you very much! my questions are answered. Do you know how long it takes to get from Terminal 3 to 2 via the free shuttle buses? Also do you know if there are flights to Davao at Terminal 3? Do you know how long it takes to get to Terminal 2 from Terminal 3 via the free shuttle buses? Also, are there domestic flights to Davao at Terminal 3? Thank you for the info... it helps me to get in Lucena City. I'm from Davao and it's my first time to travel going Lucena. What will be the best and safe ride for me to get in the BUS TERMINAL going Lucena from the Airport? Thanks for all the info and sorry about the multiple posts. The message telling me to wait until the post was verified popped up in a foreign language hence the multiple posts. moodysf, from the airport, taxis can take you to Buendia corner Taft avenue to at JAM Transit terminal. taxi fare is around PhP80 and not to exceed P100. If you're passing NAIA Terminal 3 and feeling adventurous, take the shuttle at the exits going to MRT/LRT (fare=P20) drop off after crossing Taft avenue (where the LRT is), then walk back towards Taft avenue then board jeepneys going to Quiapo/Divisoria then request the driver to drop you off at the bus terminal of JAM on Buendia. aiport coupon taxi cost 450pesos. Is this for both car or van prices?? We need a van for lots of luggages. anonymous, the P450 i quoted is a big car, much like a toyota avanza or revo, with lots of luggage space at the back. it's also fr Makati CBD too and fare increases as you go farther. thank u much for the quick reply. isnt bad enough with the luggages. anonymous, how many are you? the coupon taxis have specific fares to certain designated areas. i've never actually rode them, I just asked them once just to know. at least they're safe. no meter since it's a contract price. available at the airport exits, get the coupon from the counter, pay then ride. just wanna ask if the marriott hotel front of the terminal 3 is open now or still close? what is the closest hotel in terminal 3? is it marriott hotel infront of terminal 3 is open or still close? what is the nearest hotel in terminal 3? Hi! We don't want to take a cab anymore. Do they have overnight or long-term parking at NAIA (Centennial) Terminal 2? How much is the fee? Great site! I know this is in your Airport Fees post, but just to reiterate: the Travel Tax (P1,620.00) for international flights may or may not be tucked into your ticket price. If you buy your ticket via a travel agent, make sure the price is tucked in. If you buy online (eg CebuPac, PAL, Jetstar), you'll have to pay the Travel Tax at the airport, aside from the P750 Terminal Fee (for international flights). Just to keep in mind so you're not short of cash at the airport. And every time I fly out of the Philippines, I keep pesos for cab fare for my return to Manila, and I tell the yellow cab drivers up front that I have only enough for my usual fare. The metred yellow cabs are sometimes dodgy and the drivers then just choose to turn off the metre and accept what you give, because they'll end up paying their company whatever is in excess of what you choose to pay if you dispute the fare. It usually costs only P180-P200 to get to my flat from T1 so I have only P200, but a couple of times the metre already got as high as P300 using the same route and without traffic. Caveat emptor, etc. From NAIA, how can i get to divisoria? What are hotels situated near divi? Forgive me. I planned to visit Manila, and this would me my first. Hope you could help me. Thank you & God bless! An, which NAIA terminal? From manila airport terminal 3, you can ride the shuttle bus to EDSA LRT taft then ride a Divisoria-bound jeepney there. from Domestic airport, terminals 1 and 2, you can ride the jeepneys bound for Baclaran, then transfer to Divisoria-bound jeepneys. These days, it's hard to flag a metered taxi at the airport much more going to Divisoria. so glad to see this site, very informative..pwedi po malaman kong pano mag commute papunta calamba laguna from NAIA po. 1. I would like to know how much we are going to pay for 4 days parking at NAIA Terminal? 2. To where should we drop off for Cebu Pacific International flight? anonymous, i've yet to try it but i have conflicting reports on this. some say P120/day or lower but cheaper ovenight parking there against park n fly. What are the fast food inside terminal3? hello i just wanna ask from las pinas viraville town homes classic how to commute to NAIA terminal 3..hope you could help me. Thank you & God bless! I tried riding the shuttle from T3 to EDSA MRT yesterday. Question: Can I also ride that shuttle when going to T3? What is the ealiest time I can catch that shuttle? are there cheaper pensionne hotels in the nearby airport? Hi,we'll be arriving from an international flight late around 11pm.Is it easy or safe to just take a taxi outside the airport?Which taxi could you suggest is reliable? We'll be going then to a hotel in Ermita. I tried to ask the hotel if they can pick us up at the airport,they asked 1,500 php for one-way,I guess it's too much compared to coupon taxis.I'll try what U said. dang,, whoever made this,, I salute you..! If they had read the post,, they can get the answers themselves..
Just want to ask about the Free Airport Shuttles do they operate 24 Hours? I'm arriving 11PM NAIA 1 and leaving NAIA2 6AM...Thanks!!! The free airport shuttle from and to NAIA 1 and 2 is it 24 Hours? and are there any 24 Houre stores in the airports? I am landing at terminal 1 and need to get to terminal 3 for a connecting flight and only have 2 hours to get to terminal 3. can i make the flight? how far is it from terminal 1 to 3? A taxi is probably my best bet if i am to make my flight on time right? How safe is park n fly? Have you tried availing of its services before? We'll be going to Bohol from April 5-8 and intend to leave our care there. Will appreciate to hear from you ASAP. Thanks. magkano po ang bus fare from Eastwood to NAIA 3? alam po ba niyo ang sked? Hi! We will be arriving at NAIA 1 at 12:00 midnight and will be transferring to NAIA 3 for the first flight of Cebu Pacific (4:45 AM) to our province. What's the safest taxi will you recommend and how much would it cost. Is NAIA 3 operating on a 24-hour basis? Hi! Pwede ba na after magallanes direcho ako hanggang dun sa parang skyway na pa left turn na airport road? madadaanan tramo bridge, and then ang dulo nun ay yung shell. tapos andrews avenue na yun. Hi I'm from Paranaque. I leave near the airport road, but I don't know how to commute to Naia Terminal 2 from my place (aside from taking a cab). Is that really the easiest way? Iikot pa ako ng EDSA or Baclaran just to take a bus or jeep, when I'm already near Naia? Hope you could help. Thanks! Hi I'm from Paranaque. I leave near the airport road, but I don't know how to commute to Naia Terminal 2 (aside from taking a cab). Is that really the easiest way? Iikot pa ako ng EDSA or Baclaran just to take a bus or jeep, when I'm already near Naia? Hope you could help. Thanks!! hi tutubi! im from cebu and i have a scheduled exam Trident Tower makati next month. please give me directions on how to get from naia to Trident Tower? thanx! anonymous, if it's your first time in manila, suggest you just take the metered taxi from the airport to makati. it's just around P100 never beyond P150 unless it's heavy traffic, around P200 if you take the yellow airport taxi and about P420 for the coupon taxis with receipt). I used to work in Trident tower on Buendia (Sen. Gil Puyat Avenue) beside the old site of Shell Maya. The building is a green color and shaped like a tuning fork, there are only two prongs but it's called Trident :P if you want to commute there, it's not easy for first timers. hi tutubi, i am coming back to the philippines next week, just want to ask how much is the airport metered taxi fare from airport to sm north edsa? thank you. anonymous, metered taxi from NAIA terminal 3 to SM North EDSA is about P200 at off-peak hours. I live near SM North and Trinoma that's why i know and i prefer to travel early morning flights for faster travel time. At around 7am to 8pm, your taxi fare might shoot up to P250 due to heavy traffic. HELLO PO.. MARAMING SALAMAT SA VERY INFORMATIVE SITE.. NAKAKUHA PO KAMI NG HOTEL WHERE WE WANT IT.. THIS SITE SHOULD BE RECOMMENDED..
Hi, could I ask whether it is safe for me to stay at the terminal 3 to wait for my connecting flight? Coz I will arrive there about 4am n my next flight is 12noon. Tnx. Thanks alot for your prompt reply. Is there any mall or any tourist attraction around/near the airport? And those areas are not usually open early in the morning, right? hi, i'm from kuala lumpur, just want to ask, i'll go to traders hotel in roxas boulevard from terminal 3, approximately, how much airport taxi fare should be paid from terminal 3 to there? is there any other transportation for alternative? and how long time it takes to reach there? thanks you. anonymous, commute to NAIA terminal 3 from victory liner bus terminal is described above with EDSA as reference point. How to go to ITI hangar at Andrew Avenue from Terminal 3? Is it possible to walk there or does the Loop bus passes by? cancelled po ba ang mga flights sa NAIA ngaun? hi, im going to manila on august. Do you have idea on cheap pension house near RCBC plaza makati? If from NAIA 3, i will go to RCBC Plaza - Makati, how can i get there via bus or jeepney? i have an exam in trident tower in september, I was wondering where I could find a place that is near trident tower and that is affordable...i hope you can help me......thanks! Hello there.. I'm Filipina and am returning home on Saturday after a month's visit in Malaysia.. I'm on a tight budget. I would like to stay in a hotel or transient house that charges between 500-700 a night or cheaper and within wifi zone.. air conditioned rooms are also a must.. Otherwise, my mom or brother would be staying with me.. I'm planning to stay in Manila for a week, as I have some business to do there.. I'll appreciate it if you could suggest a place that meets my requirements.. thank you..
im wondering if you can stay overnight at teminal 2? is there a waiting lounge at naia2? i was just wondering magkano kaya ang fare pag galing ka NAIA 2 hanggang sa marikina pag mag tataxi.. first time ko kasi mag taxi dahil walang susundo sakin and im only 18yrs old =[ hindi po ba nakakatakot? hi! your patience is commendable. you're very generous with your time, too. hope you can help me...i'll be arriving manila at around 12pm on dec. 17. i've another flight to catch for cebu on the same day at past 7pm. would you know if there's a place at the airport where i can leave my luggage until my next flight while i do a short tour of the Mall of Asia before before my scheduled flight in the evening? does cebupac allow very early luggage check-in? thanks a lot and God bless! Hi! I have read that there is overnight parking available at Terminal 2 but how about at/near Terminal 3? I have posted repeated inquiries at NAIA's Website but alas, there has been no reply...I will be traveling via Cebu Pacific and was hoping I could park my car for three days at Terminal 3 parking. Would that be okay? anonymous, AFAIK, cebu Pacific does not allow early check in. You can only do so once the check in counters open for your flight which is just a few hours before your ETD. You can verify with them though just to be sure. Thanks so much! :) you're blog and discussion boards are really very helpful! anonymous, just take a taxi going there, it's not easy if it's your first time to go to makati and manila. taxi fare is around P120 to P150. if not, it may take at least 3 rides going there by commuting. am leaving ozamiz city by cebu pacific and arriving manila around 10:05 a.m. terminal3. hw can i get to terminal2? how many minutes will it take for the shuttle bus to travel from Terminal 3 to 1? hello. i would like to ask how to get to Terminal 2 Arrival from Terminal 3 Arrival. Any transport to take? hi there. could you help with the easiest way / directions from NAIA TERMINAL 1 to EDSA ? is there taxi i can take from airport international to cabuyao laguna and return? ask ako if there's a free shuttle bus from domestic airport to T3?mga ilang minutes? 1. is there a baggage counter at the airport that i can leave my bags while waiting for connecting flight which is a few hours later? 2. is there a bus or jeepney that goes to Mall of Asia from the airport? Nzah, i don't notice any baggage counter there but you may want to ask airport information. I think you're flying via Terminal 1, yes there are buses and jeepneys to SM Mall of Asia but I suggest just taking the cab. Taxis can be flagged down near the departure area, if there's a long queue at the arrival area. hi , is there an taxi service at the arrival area of NAIA that could bring me to Bacoor Cavite? (specifically to drop me at my place) How much usually is the fare? I will arrive Terminal 1 at 10:10pm, is there shuttle bus available at that time to go to other airport for my flight at 4am? Hi, as of date, is the flag down rate for yellow taxi at terminal 3 still 70 pesos initially, and 4 pesos subsequently? How much would it cost me to go to SM Cyberzone, Gil Puyat Ave. from terminal 3? Thanks a lot! I just wanna know how long it will take to get to RCBC Towers from NAIA 3? And which way has the shortest way through there? I have an appointment at RCBC Towers this wednesday @ 7:30am. I would appreciate really if you can help me how to get there. Hi! Salamat sa helpful na webpage nyo. may tanong lang ako. magkano at how long ang byahe from cebu pacific terminal (3) to international airport (terminal 1)? will it take 1 hour considering the traffic (kung meron)? again, maraming salamat sa helpful info nyo. hi! i would like to know please...can you please give me an approximate fare if you ride those coepon taxis or yellow airport taxis from NAIA terminal 1 to Pasig City? I don't know how to get around Manila, and taxis are my only option to go to my destination...thanks you very much! anonymous, where in Pasig? i've yet to take the coupon taxi from the airport for years now but probably around PhP500 to Ortigas Center center. the good thing with coupon taxis is that they have fixed fares per destination. I saw coupon taxi rates displayed at the airport, i should've taken a picture to post the information here. Is the overnight parking charge the same, as what is posted here? If i ride a bus from EDSA to Manila Domestic Airport, how long is the walk? hello I, JOS fr Belgium will arrive at 15h40(officially) 24oct.2011 in Aquino Intnl airport.I have next an domestic flight on terminal 3 with CEBUPACIFICAIR at 18H same day.How to reach that terminal 3 WITHOUT trouble? ?.Is there enough time to reach that terminal 3 before departure time (18h00).? ?is there a free shuttle? How much to pay for airport tax?? can my sundo allowed to get into the area where I can get a registered taxi para may company ako. are there still have coin phone inside the arrival area? how much...is it a quarter....how many. thanks. JOS fr.BELGIUM ,PLEASE ANSWER MY QUESTION HERE FROM AUGUST 17.How can I find the shuttle bus outside aquino intnl airport to terminal 3. I arrive at 15.40 officially IN AQUINO INTNL AIRPORT and have flight ,departure time at 18h00,in terminal 3 TO DAVAO,? Is this enough time? ?HOW TO RECOGNIZE SHUTTLE BUS AND WHERE,??? hello .. how can i commute from bataan to terminal 3 ? hello.magkanu po fare ng taxi from pasay victorybus terminal going to naia 1.gaanu rin po kalayo,tnx. Gud evening! how long will it take me from mall of asia down to Ermita Manila and wat mode of transportation is the most accesible? I'm arriving tomorrow from the an Int'l flight, can you please advise how will i know which taxi service is the legit one and how much is the rate from airport to Pilar Village, Las Pinas city? hello! how much po ba taxi fare from terminal 3 going to cainta near Jollibee parola? thanks! Hi! I just wanna know if the overnight parking at NAIA terminal 3 is still available for travellers at the rate of 50pesos/ night. We are sched to cebu this weekend. Thanks! hello po! first time ko po sasakay ng plane..anung terminal po ba ang cebupacific air galing ng tacloban?meron pong magsusundo sakin san po ba siya pweding maghintay?tnx po..
what is the alloted waiting time for domestic flight? is it also 2 hours like that of international? thank you. hi, im going to naia terminal3 to pick up a friend of mine. i just want to ask, from mrt taft station, where can i find a jeep/bus going to naia T3? Hi tutubi, ask ko lang sana kung saan pwede magstay for few hours near NAIA. 0355hrs kasi ung arrival ko, so I'm planning to stay in a hotel/inn or somewhere that I can rest while waiting for a safe time to travel like 1000hrs. I will be coming from terminal 1, what would be the best way to travel from naia terminal 1 to the place that you suggest for me to stay in? Thanks, Shine. Hello, just want to ask if how much taxi fare from Naia T3 to divisoria? is overnight parking at terminal 1 safe? we'll be flying to singapore this thursday, upon reading your posts, it gave me other option where to park. Originally, we're planning to park at park n fly but it's a bit expensive. The most commuter friendly is TERMINAL 2..Wherein there were so many buses coming in and out in the terminal perimeter. kabayan, ilan oras ba ang process ng bagahe pag nakalapag na ang eroplano sa terminal 3 imean mula eroplano hangang sa makalabas na? saka ilan Hours kaya mula terminal 3 to UST sa bandang likod sa my dapitan, magkano kaya aabutin ng fare sa coupon taxi? kc po 1st time kung lalapag jan using iternational fligh around 9:30pm gusto ko lang kc hubulin yon byehe sa amin.. may duty free ba don sa terminal 3.
salamat sa reaply ang bilis hehehe.. importante sakin kung ilan hrs or minute to spend para makalabas na agad, inisip ko kc baka matagal ang pag antay ng bagahe sa conveyor... saan banda ba yon duty free sa terminal 3.. may tinda kayang alak don?